Why should we adapt clinical practice guidelines for local use? While national and international bodies have made major efforts to improve the quality and rigour of guidelines, less investment has been made in understanding how guidelines can be better targeted to the local context of care. Customizing a practice guideline for a particular setting may be helpful in improving acceptance and adherence. Active involvement of the targeted guideline end users in this process has been shown to lead to significant changes in practice. As a consequence, the local or regional adaptation of national and/or international evidence-based practice guidelines has received interest from organizations in many countries and has become mandatory in some jurisdictions. For many provincial/territorial jurisdictions, de novo guideline development is simply not feasible because of lack of time, expertise, and resources. Adaptation of existing high-quality guidelines for local use is an approach targeted to reduce duplication of effort and to enhance applicability. The applicability and changes required in the organization of care to apply the recommendations are unique to its local context. Importantly, the process of guideline adaptation is a first step in implementing evidence in practice and one that promotes local uptake of evidence through a sense of ownership by the targeted end users. It is an action-oriented and concrete element of facilitating implementation of evidence. However, customizing a guideline to local conditions bears the risk that the adapted guideline departs from its evidence base and puts into question the quality and validity of the recommendations. How do we adapt clinical practice guidelines for local use? Through an active process, existing guidelines are evaluated and customized to fit local circumstances while preserving the integrity of the evidence-based recommendations. In the process of adapting a guideline, specific health questions relevant to a local context of use, needs, priorities, legislation, policies, and resources in the targeted setting are considered and addressed. With the exception of a few Canadian studies, no validated process for the adaptation of guidelines has been documented. The Canadian work in this area was integrated with an international initiative known as the ADAPTE collaboration. The ADAPTE process was developed to facilitate creation of efficient, high-quality adapted guidelines that are likely to be implemented into practice. What is the adaptation process? The ADAPTE methodology offers an approach for straightforward guideline adaptation, especially with experienced, resourced guideline panels. The CAN-IMPLEMENT offers a more in-depth process for field-based adaptation initiatives that includes the needed facilitation and methodological support, additional tools to manage and document the process and an explicit dissemination and implementation planning component. This method has been reformulated and streamlined while maintaining the essential tasks and rigour of the original ADAPTE process. CAN-IMPLEMENT approaches guideline adaptation using a stepwise process comprising three phases: Phase 1: identification and clarification of the practice issue; Phase 2: solution building; and Phase 3: solution implementation, evaluation and sustainability. Adaptation, using a method such as ADAPTE or CAN-IMPLEMENT, helps to avoid departures from the evidence base and stresses the process of aligning the evidence to the local context. It directs users to identify potential local barriers in applying research evidence to clinical or policy practice. By actively engaging the targeted users in reviewing guideline recommendations and discussing any organizational changes required, an environment for communication and collaboration among health professionals, managers and decision-makers is fostered. 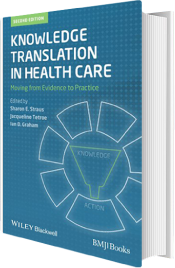 *For more information on adapting knowledge, please refer to the full publication “Knowledge Translation in Health Care: Moving from Evidence into Practice” (2013).